Johnnie Beattie is determined to make the most of his late Scotland call-up. The Castres number eight has been drafted in ahead of next month's Six Nations after injuries to nine of Vern Cotter's original squad. He admits to a drop in form this season but wants to show the head coach he is worth retaining. "Throughout my time with the squad I've felt that I have a lot to offer, that I can perform at this level and change games for Scotland," said Beattie. The 29-year-old was overlooked by Cotter, along with several other experienced Test players, when Cotter listed his 32-man pool on 20 January. But a spate of injury problems sustained over the weekend has opened the door again for the former Glasgow Warrior. "Vern named fewer looses than normal and left things open, there were a few different variables he wanted to see and he made that clear before announcing the squad," he said. "I was just delighted to get the call on Saturday and be asked to come back into camp." Asked if his form had suffered following a switch from Montpellier to Top 14 rivals Castres, Beattie conceded it had been a "tricky first half of the season". He added: "I would say there has been a dip in comparison to last year but not for lack of effort. "Things have been slightly tougher with a change of team. "The endeavour is there but the performances haven't quite been at the level of last year, so I'm still looking to kick on." Beattie's former international back-row partners Kelly Brown and John Barclay have been omitted by Cotter and Beattie has no problem with a changing of the guard. "From when I first came into the squad 10 years ago, it's completely changed and that's a great thing for Scottish rugby, the fresh faces, the young talent we are producing," he said. "I'm lucky to still be pushing for a place. "You have to keep evolving, it's the same for all of the other Six Nations teams. There are youngsters coming through and pushing older guys out, that's just the way it is." 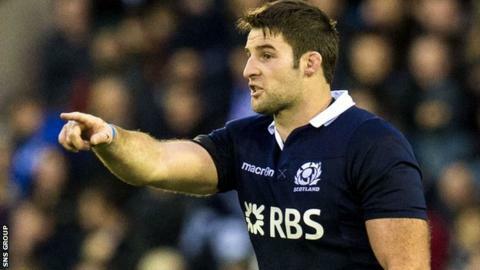 Scotland begin their Six Nations campaign in Paris and Beattie hopes the promising form against Argentina, New Zealand and Tonga in November can provide a platform from which to build. Beattie was not selected for the 41-31 win over the Pumas, came on as a replacement in the 24-16 loss to the world champions and started the 37-12 success against Tonga. "We put in place different structures, different templates for the autumn internationals and we showed that a lot of them worked against top quality opposition," he explained. "Now there's a chance to do it again, against maybe higher calibre opponents, to show we can do it on a consistent level before we head to a World Cup. "With what we've shown already and the freshness guys like Finn Russell bring to the squad and the creativity of the likes of Stuart Hogg, it's an exciting time. "I'm hoping I can be part of it."